My husband loves to build and make things from scratch. To do so, he has purchased a large amount of different tools that allow him to do as many DIY type projects as possible. I even wrote up a post about the different tools he'd suggest one have if they want to be their own handy person, and yet when I was contacted by Allen Brown with this informative post about how to pick your own miter saw, I was confused and didn't know what that was, and asked Mike if he did. "Of course," he answered. "We have one," and then proceeded to show me which of the tools in his collection was a miter saw. Now I realized that I was mistakenly calling a miter saw a circle saw, and it is something my husband regularly uses. I also see that had we had read this post before the purchase of our first miter saw, we would have been better off, because we didn't follow tip number one, and ended up needing to buy yet another, large enough to cut the wood we regularly cut. A perfect miter saw is a staple item that could make your work easier. 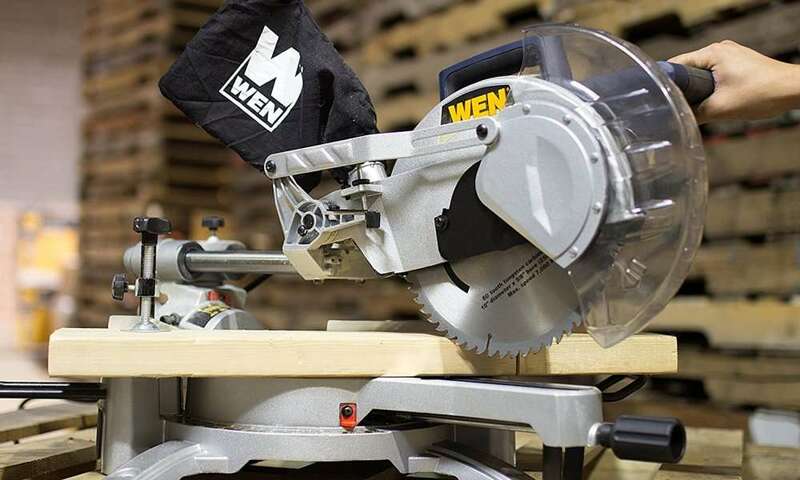 Woodworking is a field that helps you to create a variety of styles and most of this work entails making cuts, which is why you should get the WEN 70716. With a top-rated miter saw, you will be able to do your work with perfection. Buying a good miter saw is a challenge if you don’t know what to consider because each brand brings different functionality. Here are some ideas to help you choose the best one for your workshop. What size of lumber are you cutting? You need to factor in size while looking for a miter saw. Consider the kind of material you will be working on to make the right decision. With a 10-inch compound saw, you can only cut through a board that has a width of up to 10 inches. For wider boards, such a saw will not make sense because it cannot complete the cut. Think about the kind of materials you will be working with regularly so as to choose a saw that will not disappoint you. Where do you plan to use the saw? Are you going to use the saw in your workshop or do you need to move it regularly? If you believe you will not need to move the saw regularly, the portability should not be an issue to worry about. However, to work with the saw from different sites, it should not be difficult to carry. Choose a saw that is suited to the kind of schedule you plan to follow while working. While working with wood, a small mistake could ruin an entire project. You need to make accurate cuts and this can only be possible if the saw is precise enough. Get a saw that offers quality materials that will maintain the precision and accuracy on all your projects. You can make this decision based on the kind of technology different brands offer. The blade needs to be high quality and adequate for smooth cuts. You can find information about different brands from reviews, preferably written by customers. When deciding the type of saw to buy, it’s important to consider the work you will be using it for. For simple things that need angled cuts, you will do fine with a compound saw. The saw can perfectly pivot left to right and easily create compound cuts in a simple pass. A sliding miter saw differs a bit because it is able to move forward and backwards. The saw helps you to increase the length of the cut and can do everything a compound saw does. This is suitable for boards, lumber, and logs. Buying the right saw is the first step in improving your efficiency in your workshop. It helps you to avoid mistakes while cutting pieces of wood. With different brands in the market, you might find it challenging to choose the best miter saw, but this is not difficult because you only need to first consider your needs. Understand the kind of work you will be doing with the saw to pick the perfect model as shown above.